Video continues to grow and develop as a powerful part of the marketing world. Businesses and brands are using video to offer demonstrations, training, introductions, and explanations in ways that written words and static graphics can't. From an inbound marketing perspective, video offers prime opportunities to capture your target audience and lead them along on the buyer’s journey. If you’re considering using video but don’t know how to make it look streamlined and professional, now is the time to think about video editing software. Although the process of video editing may sound complicated, today’s technology offers simplified versions of software to get you producing top-notch videos with a limited amount of effort and cost. For startups or other organizations with tight budgets, getting started with a free (or very inexpensive) video editing software program makes sense. Then, if you find that your needs go beyond the program’s capabilities, you’ll have enough experience to understand how to better meet your needs with a product purchase. Plus, it might even be just a little bit fun! Making video-editing easy for less-than-technical types, it’s not necessary to understand the jargon and techniques that other video editing programs may require. Animoto is great for beginners and free to try. Monthly plans do start at $10 for personal use, with an upgraded plan recommended for professional use. Animoto functions on computers and many mobile devices including iPhone, iPad, iPod Touch ioS 7.0+, Android 2.2+. Photographers might like the plug-in feature for Lightroom that allows for photos to be imported directly. Created for marketers who are aiming to tell stories with video, Magisto promises quick and easy video creation with simple distribution options across various channels. Several editing “styles” are available depending on preferences and music options are available. Magisto is free for Apple products including iPhone, iPad, and iPod Touch iOS 7.0+, as well as Android users. The free version only allows for very short videos, though. Professional premium subscriptions start at around $10/month, allowing you to add your own text and logo, create longer videos, and choose other upgraded features. For Apple users, iMovie allows access on Macs or iOS platforms to create top-of-the-line videos on laptops or mobile devices. High-end features include action shots, green screen, sound effects, title animation, voice-over recording, and high-fi filters. Depending on your device or computer, a one-time cost of either $5 or $15 is required, but no ongoing monthly fees apply. 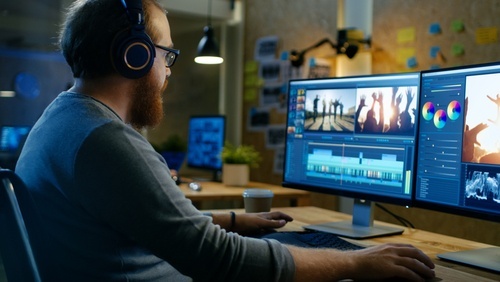 Designed for personal use, PC users can take advantage of this free software for dipping your toe into the world of video editing for marketing. Movie Maker offers basic features like trimming, merging, subtitling, and various themes. It probably won’t work for the long term, but it may function as an adequate way to learn about the process of video editing without a big investment. A highly professional free video editing software, this one might take some getting used to when learning how to use it. Although it is technically free, the company does sell upgrades that offer a significantly higher level of features with monthly, annual, and outright purchase options. If you’re up for a challenge and are looking for a higher-end video editing software, Lightworks might be a good fit. Video has the potential to reach your target market, build into clientele, and deepen your relationship with potential or existing customers. Get started with these video editing tools to create stunning videos that engage your audience and keep them coming back.